Football season is right around the corner. AMEN! 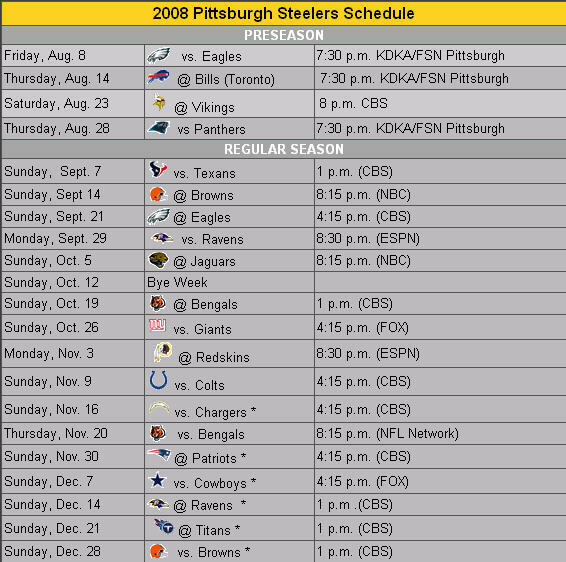 The Steelers schedule (if you're interested, and you SHOULD be) is posted below. My prediction is that in the regular season, the boys in black and gold go 11-5. You heard it here first. i love that their first pre-season game is vs. the EAGLES! or, if you're a philadephia native, DA IGGLES. I predict 14-2. I'm looking forward to November 3. I'm pretty sure I will be at that game. Hey that's terrific……I don't watch sports……but if I did it would be football.